The central philosophical challenge of metaethics is to account for the normativity of moral judgment without abandoning or seriously compromising moral realism. 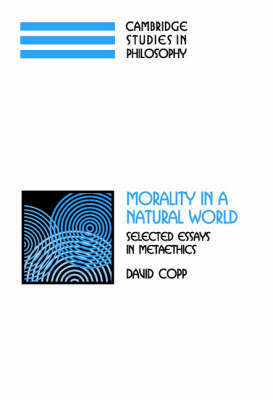 In Morality in a Natural World, David Copp defends a version of naturalistic moral realism that can accommodate the normativity of morality. Moral naturalism is often thought to face special metaphysical, epistemological, and semantic problems as well as the difficulty in accounting for normativity. In the ten essays included in this volume, Copp defends solutions to these problems. Three of the essays are new, while seven have previously been published. All of them are concerned with the viability of naturalistic and realistic accounts of the nature of morality, or, more generally, with the viability of naturalistic accounts of reasons.